When the utility has a loose connection on the “neutral” conductor, its unbalanced current can flow on other conductors, like you or the one going to the cable box!!! This cable box burned up from a high current flow on the grounding conductor termination, inside the cable box. 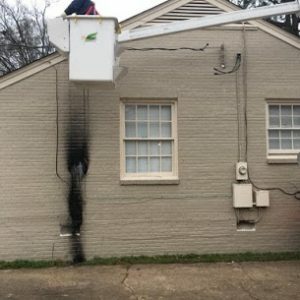 A fire resulted from overloading the grounding conductor at the cable utility box. It is a requirement for it to be bonded to the neutral at the service equipment. The bonding screw between the neutral bar in the electrical panel and the panels metal can was also burned off. Lots of repairs were required when this property was reconnected to power. The quote was “Furnish all labor and material to complete the following: Permit and repair. Remove the existing service equipment, install a new service entrance cable, meter-base, the main breaker-panel outside and main lug-panel inside (remove the fuse panel and install a breaker panel). Remove the improper wiring, reconnect the original circuits and label them. Install receptacle outlets as required for the minimums of an existing dwelling (1-120 Volt smoke detector outlet, new receptacle outlets (each room must have at least 2- receptacles), AFCI /GFCI protection on circuits as required and replace the damaged or improper receptacles”. As a little extra for the customer I installed LED lamps on the outside lights!! Call me for a quote!